Are you tempted to buy a nail gun? You have done your research and learned everything you can about this functional power tool but you are still unsure of its features? In order to fully understand how a nail gun works, you need to be familiar with its parts. An air compressor is needed for the nail gun to function and the compressed air is the most important component of this power tool. As compressed air flows into the nail gun’s handle, its trigger lets a small amount of the forced air into the tube and to the back of the cylinder. That air as well as a tiny spring inside the nail gun pushes a large valve in order to be able to store forced air continuously in the nail gun. Once the trigger of the nail gun is pulled, the compressor is free to force unrestricted air into the large valve which in turn slams the piston into the head of the nail and effortlessly fires the nail straight into the surface. All these movements are executed in less than a second to allow continuous firing of nails into a surface. The speed and preciseness of a nail gun should be enough to convince you of its usefulness and functionality. But always make sure to read the operating manual and don on appropriate safety gear when using it. 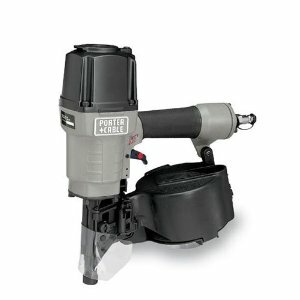 Here is the list of best nail gun reviews of top framing nailer sets. Just go through these nail gun reviews and we are pretty sure that you will be able to find the best framing nailer that fits your budget and requirements perfectly. 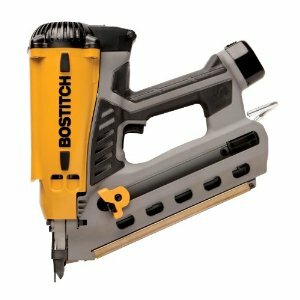 For workers, whether professionals or do-it-your selfers, who are bothered with either an air hose or an electric cord dangling from the handle of their nail gun, the Bostitch GF28WW Cordless Framing Nailer is a welcome tool. Relying on a nickel cadmium rechargeable battery paired with a framing fuel cell instead of on an air compressor or electric power supply, the tool eliminates those pesky attachments. With the fuel cell powering an energy-efficient gas combustion motor, the nailer can drive up to 1,200 nails. Perhaps more importantly, the absence of the attachments provides flexibility to the workers, allowing them to move around the work area with having to lug an air compressor, or to work in new construction sites where no electric power is yet available. The Bostitch GF28WW shoots wire-weld 2- to 3½-inch framing nails with diameters between 0.113 and 0.131 inch angled at 28 degrees. This makes it suitable for, in addition to framing, decking, fencing, sheathing, subflooring, and trussing. With its adjustable depth guide, you can easily set the desired nail depth. Its magazine has a capacity of 66 nails, and it features a low nail lock-out mechanism to prevent dry firing. This helps extend the service life of the tool as well as protects the surface of your work from nicks and dents. Working with the nail gun is comfortable as it is lightweight, weighing only a shade over 8 pounds. Its weight is evenly distributed for a balanced feel. For a soft yet firm grip, the handle is over-molded with rubber. This prevents the nail gun from slipping in your palms. Indeed, you can work all day with it without getting unduly fatigued. If, however, you do need a break, an adjustable rafter hook is mounted between the handle and magazine that you can use to hang the tool on your belt, joists, or rafters. The Bostitch GF28WW Cordless Framing Nailer measures approximately 20″ D x 6″ W x 19″ H.
When working on the roof, a large magazine capacity is not only convenient but is actually important as it avoids the need for frequent reloads. With a Porter-Cable Coil250 Coil Framing Nailer, you get a coil magazine with a capacity of 225 to 300 nails, depending on their diameter. The framing nailer boasts of a powerful motor that delivers high performance. It can deliver an operating pressure that ranges from 70 to 120 PSI, enabling you to drive 1½- to 2½-inch framing nails with diameters varying from 0.099 to 0.120 inch. The magazine is fitted with a nail support tray that easily adjusts to the appropriate nail length, and is designed to accept wire-collated nails angled at 15 degrees. With double cams and guides, nail feeding is smooth and jam-free. The nailer is capable of both sequential and bump-fire modes. You can choose to sink your nails at precise locations with sequential setting, or go through the process quickly with bump-fire. A depth-of-drive adjuster allows you to choose nail depth without any tool. As the adjuster has detents, you are assured of uniform nail depths. The exhaust vent at the rear end of the nail is also adjustable with the need for tools, allowing you to quickly direct exhaust away from you or your work. Enclosed in a lightweight aluminum housing, the Coil250 nailer is convenient to use even for prolonged periods. This is further assured by its ergonomically designed handle that is wrapped with a rubber grip. You can work eight hours on the roof with the nailer and not feel unduly fatigued at the end of the day. Dimensions of the Porter-Cable Coil250 Coil Framing Nail gun are 14″ H x 11″ L. Weight is 6 lbs. For some people, working with power tools that rely on an air compressor or electric power can be uncomfortable. Lugging an air compressor can be wearisome, and having air hoses or electric cords limit your movements can be annoying. When doing framing work, a Hitachi NR90GR2 Cordless Framing Nailer can eliminate these problems. The NR90GR2 relies on fuel rods and a 7.2-Volt 1.4-Amp-hour NiCd battery for power to drive framing nails even into the hardest of woods. The battery packs enough energy to fire up to 4,000 nails on a single charge. You don’t need to count your nails though. An indicator lamp lights up if the battery runs out of juice, so you won’t run out of power unexpectedly. Recharging takes about an hour. 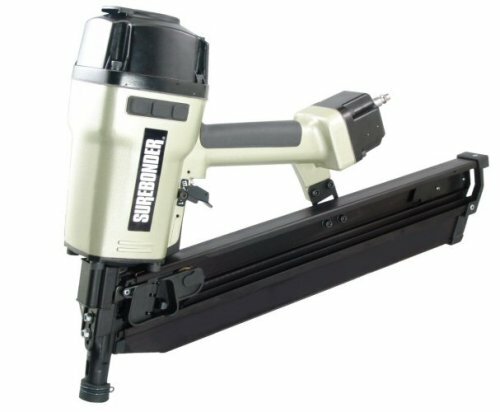 Designed to shoot framing nails with lengths of up to 3.5 inches and diameter of 0.131 inch, the nailer can be used for framing, fencing, sub-flooring, decking, and punch-out work. Depending on the diameter of the nails, the magazine, which is angled at 21 degrees, can carry from 32 to 35 plastic strip collated nails. Loading is an easy two-step procedure. All you have to do is slide the nails into the magazine, release the feeder, and start firing away. Depth of drive is adjustable, and a dry fire lockout mechanism prevents dry firing that can damage the tool or your work. Firing mode is sequential. The Hitachi NR90GR2 Cordless Framing Nailer is ergonomically designed for maximum possible convenience and comfort while working. Its 7.9 pounds in weight is evenly distributed for a balanced feel in your hands. You can operate it even with a single hand. And elastomer compound wraps its grip handle to absorb vibration when fired, and to prevent it from accidentally slipping from your hold. At the heel of the grip is a collapsible rafter hook for hanging on your work belt while it is not in use. With dimensions of 14.5″ x 4.25″ x 13.75″, along with the lack of any attachments, the NR90GR2 is easily maneuvered even in tight spaces. The nailer comes with a 7.2-Volt battery, battery charger, hex wrench, safety glasses, and carrying case. Driving gauge 16 nails with lengths varying from 2 to 3½ inches, the Surebonder 9772 Pneumatic Round Head Framing Nailer is suited for most decking, fencing, framing, roof decking, sheathing, and subflooring jobs. The magazine is angled at 21°, allowing you better access to tight corners which is common in framing work. With its capacity of 80 nails, reloading is minimized. Use plastic collated nails with the nailer. Although Surebonder 800 Series nails are recommended, the nailer accepts most other brands. Equipped with a lockout mechanism, the nailer does not fire if there are only three nails left in the magazine. Operating at an air pressure between 60 to 100 PSI, the Surebonder 9772 easily drives the nails into all types of wood, including engineered wood. Compressed air is delivered via a ¼-inch male quick-release air inlet at the heel of the handle. For a speedy job that does not require precise placement of nails, the nailer can be operated in a bump fire method. On the other hand, if you want your nails to be in specific locations, you can switch to a sequential firing mode. A small lever mounted above the left side of the trigger need only to be pushed in and up for the former mode, and down for the latter. Depth of drive is also adjustable. You need, however, to use the supplied wrench to turn the safety element mounted on the nozzle. The air exhaust at the other end of the nailer is also adjustable. Unlike the depth of drive, this does not require any tool. Toenailing is made easier with the nailer’s saw-toothed nozzle. This, however, can be covered with a rubber cap if you need to protect the surface of your work. With a casing constructed out of cast aluminum, the Surebonder 9772 Pneumatic Round Head Framing Nailer is lightweight yet rugged enough for heavy-duty use. It weighs only 8.2 pounds, making it easy to use. It also helps that the handle is fitted with a rubber grip. Dimensions of the device are 18.1 x 14.6 x 3.9, all in inches. 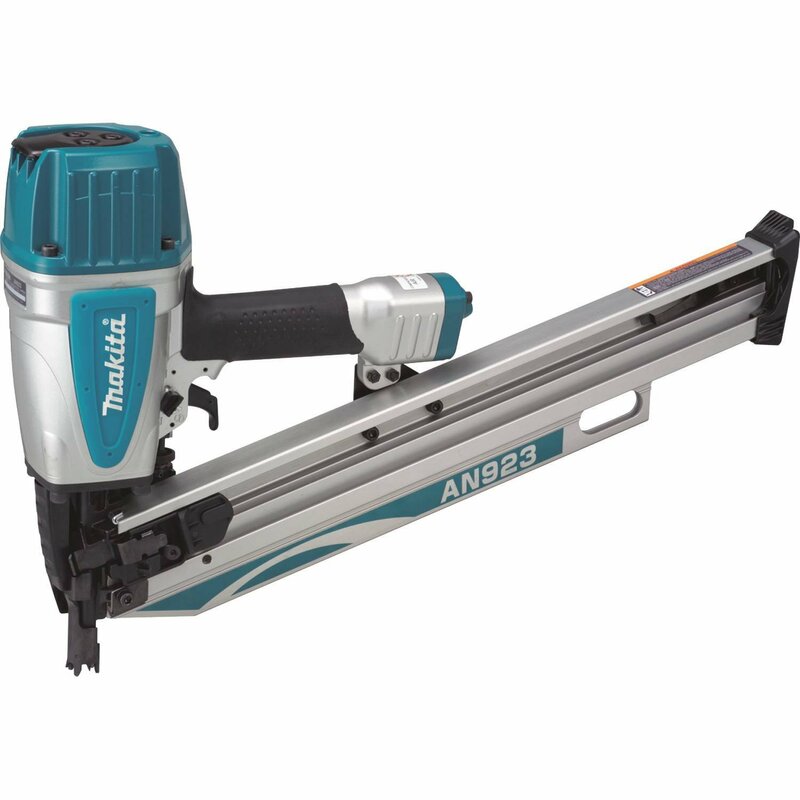 The large air capacity of the Makita AN923 Framing Nailer enables it to operate continuously at air pressures ranging from 65 – 120 PSI. With this pressure, it can easily drive nails, whether plastic or wire collated, with lengths varying from 2 – 3.5 inches with a shank diameter of 0.113 – 0.162 inch even into hardwoods. The Makita AN923 incorporates plenty of features designed to make your work safe and efficient. It includes a 3-mode adjustment switch which allows you to lock the trigger to prevent accidental firing, fire sequentially pressing the nozzle against the wood and pulling the trigger for each firing, or use the bounce fire mechanism firing a nail simply by pressing the nozzle against the wood. The nailer has a retractable hook for hanging it close on hand in between firing nails allowing you to work on other things. The grip is wrapped with rubber both to provide you with a non-slip grip and a comfortable hold, while a port that can be rotated 360° without tools directs the blast of exhaust air away from you. Adjustment of the depth of nail can also be done without tools. With nine settings to choose from, you can get your nails to the exact depth where you want them. On the nailer’s nozzle are spurs intended to prevent it from slipping when pressed against wood, especially if done so at an angle. Dry firing is prevented as the nailer will not fire if there are only three nails left in the magazine. Reloading is done through the rear of the sturdy aluminum magazine. It can hold as many as 74 nails. Compressed air from a compressor can sometimes contain dust and other materials. These, however, are kept from entering the AN923 with a built-in air filter. To protect the tool and the wood, rubber bumpers are installed. The Makita AN923 Framing Nailer measures 22″ H x 4.25″ W x 13.68″ L allowing its use in between standard 16-inch framing studs. It weighs about 8.7 lbs. Large Capacity Air Chamber for increased power to drive nails varying in length from 2″ – 3-1/2″.